On Monday, Hereditary Prince Alois met with Zeid Ra'ad Al Hussein, the UN Commissioner for Human Rights, who is on a two-day working visit to Liechtenstein. The Commissioner also met with Minister of Foreign Affairs Aurelia Frick, President of the Landtag Albert Frick, and Minister of Social Affairs Mauro Pedrazzini. His visit was focused on discussing an independent human rights organization in Liechtenstein and the situation among refugees in Liechtenstein, among other related topics. No photos of the Hereditary Prince with the Commissioner just yet, although more information about the visit here. The photo of the Commissioner with Aurelia Frick is linked above. Can you believe it? These are the last rounds of the group stages of the Liechtenstein Tiara Championship that have kept us busy for most of the news-poor summer months. How time flies! And without much further ado - let's dive into it! We will again have a double round before we head right into our first semi-final next time. Enjoy! 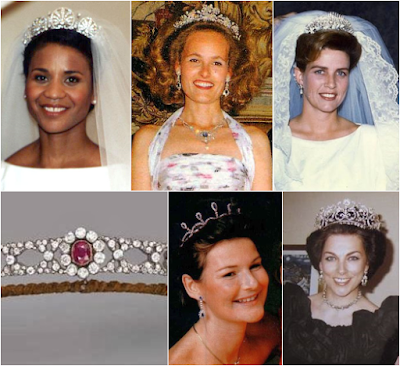 Facing off against each other for the last time Group A are the following six tiaras from the vaults of the (extended) Princely Family of Liechtenstein: (first row from the left) the Habsburg Fringe Tiara, Princess Franziska's Diamond Tiara, the Diamond Honeysuckle Tiara, (second row from the left) the Douglas Floral Tiara, Princess Elsa's Diamond Tiara and Princess Marie's Wedding Gift Tiara. 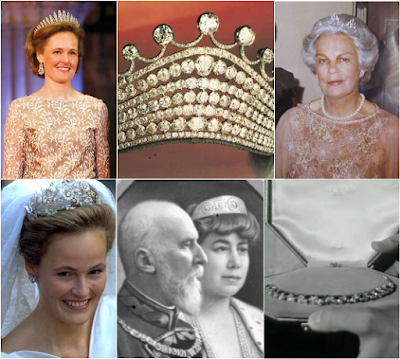 Group B, meanwhile, sees the last round of chosing your favourites between (first row, left to right) the Kinsky Palmette Tiara, the Bavarian Pearl and Diamond Floral Tiara and the Bulgarian Fringe Tiara, as well as (second row, from left) the Ruby and Diamond Tiara, Princess Margaretha's Sapphire Necklace Tiara and Queen Olga of Greece's Boucheron Diamond Tiara. 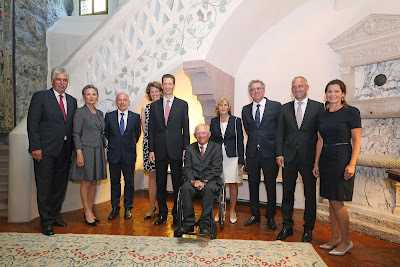 On August 19th, Hereditary Prince Alois welcomed board members and management officials of the Swiss-based company RVK, which represents small- and medium-sized health insurers in Switzerland and Liechtenstein. 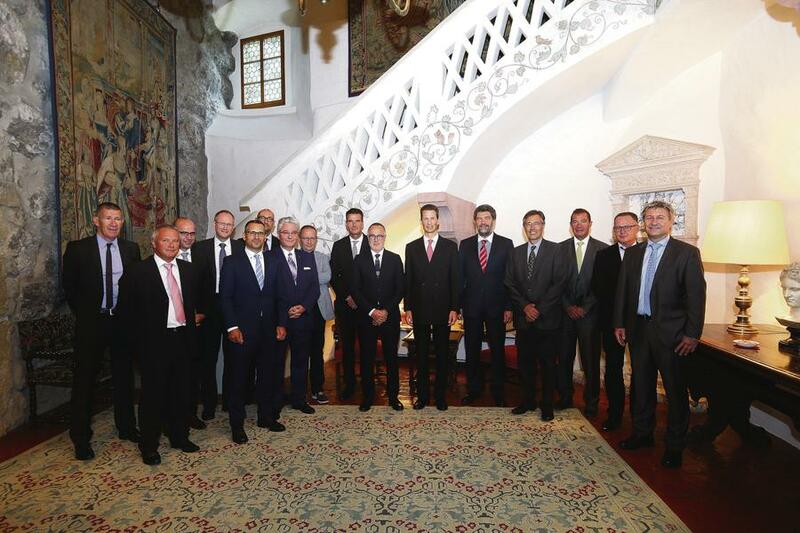 Alois greeted the group at Schloss Vaduz, while Minister of Health Mauro Pedrazzini greeted them at the government building. The RVK members were in Liechtenstein for their annual two-day retreat. 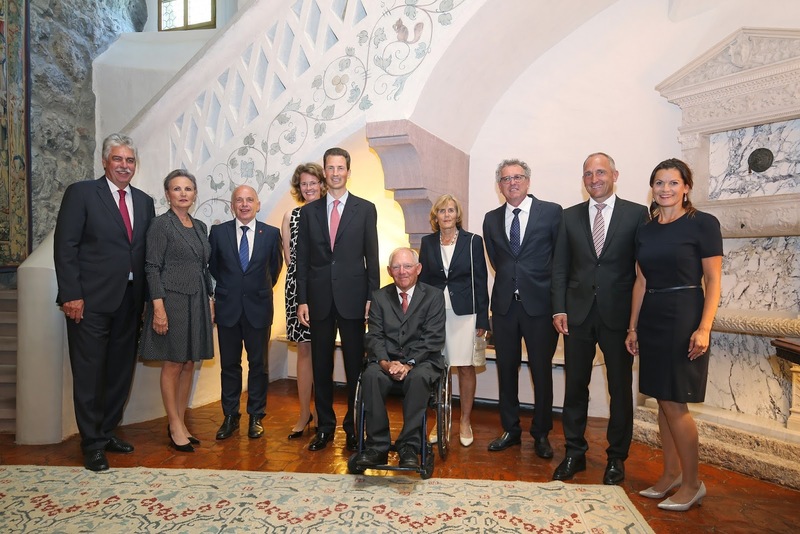 On Monday, Hereditary Prince Alois and Hereditary Princess Sophie welcomed the finance ministers from Austria, Germany, Luxembourg, and Switzerland to Schloss Vaduz in advance of the talks that will occur on Tuesday, August 23rd. These talks will be held at the invitation of Prime Minister Adrian Hasler, who was also present to greet the international dignitaries. The talks will focus on several topics, including corporate taxation, financial regulation, and the general fiscal challenges that Europe faces now and will face in the months to come. Let's have a double round of voting for the Liechtenstein Tiara Championship, shall we? We shall. After looking at one of the sparklers in the race a little more closesly over the weekend, it's now time for the second to last round of the group stages of both Group A and Group B. Have fun voting not three but six times below! Facing off against each other in Group A are six tiaras from the vaults of the (extended) Princely Family of Liechtenstein, namely (first row from the left) the Habsburg Fringe Tiara, Princess Franziska's Diamond Tiara, the Diamond Honeysuckle Tiara, (second row from the left) the Douglas Floral Tiara, Princess Elsa's Diamond Tiara and Princess Marie's Wedding Gift Tiara. The entries of Group B are the Kinsky Palmette Tiara, the Bavarian Pearl and Diamond Floral Tiara, the Bulgarian Fringe Tiara, (second row, from left) the Ruby and Diamond Tiara, Princess Margaretha's Sapphire Necklace Tiara and Queen Olga of Greece's Boucheron Diamond Tiara. Which ones get your vote? Attending National Day in Liechtenstein: Quite An Experience! see here, here and here for previous posts of his. As many of you may know, every year, on August 15, the Principality of Liechtenstein celebrates Staatsfeiertag: the National Day. The National Day was celebrated for the first time in 1940. The date was convenient, as August 15 was (and still is) already a Catholic holiday (Feast of the Assumption) and a day later (August 16) was the birthday of Prince Franz Joseph II, the father of the current Reigning Prince, Hans-Adam II. For more background information about the National Day, have a look here. I've always wanted to experience the National Day myself and this year, I was able to do so. I'll give you a report about my impressions, including some recommendations for any of you who are planning to go to the National Day yourselves one day! Me and my boyfriend made a little tour of southern Germany this summer and we made sure that a daytrip to Liechtenstein on the National Day could be planned into our schedule. So on the actual day, at 8am, we drove from the little town of Wildsteig (southern Bavaria) to Vaduz, a 2,5 hour drive. First tip: when you go by car from this direction, drive via Feldkirch, in Austria, near the border with Liechtenstein. Navigation systems lead you through a small part of Switzerland as well, which will cost you a lot of toll. Driving via Feldkirch (and thus avoiding Switzerland) won't make your journey much longer (thanks Stefan for this great piece of advice). Our journey went very smoothly. The official website of the National Day clearly wants to deter visitors from arriving by car, and if they do, they want to dissuade people from parking in or at the outskirts of Vaduz, as parking spaces are limited. Shuttle busses would drive from designated parking spots in the area to Schloss Vaduz. When we arrived at the designated parking spot in Schaan (near Vaduz), it was totally deserted: no cars, no people on the streets. We decided that it would be ridiculous to park here: we decided to get as close to the Schloss as possible. So we drove further, to Vaduz. There, it was less deserted and cars were being led to a big parking space (free of charge), where only a few cars and busses were parked; turned out that this was the parking space of the Rheinpark Stadion. We were now at the outskirts of Vaduz (which is, of course, a very small city anyway) and while walking the short distance to the centre, we had our first view of Schloss Vaduz, which is a magnificent sight. We didn't have much time to enjoy it unfortunately: our schedule appeared to have been a little bit too tight. It was already 10h50. At 11h30, the Official Act of State would take place at the lawn next to Schloss Vaduz (preceded by the procession of the Princely Family), so we didn't have much time to make our way all the way up to the Schloss! So here comes the next tip: make sure you have enough time! The climb to the Schloss is quite steep, and that's an inconvenience when you're in a hurry and when it's about 27 degrees Celsius! And I don't like warm weather anyway... So when we reached the Schloss, I was exhausted! We really had to rush to make it on time, but we made it! On the meadows near the Schloss, there were quite a lot of people, I guess a few hundred people. A lot of Liechtensteiners, but also many tourists: Americans, Brits, Italians and Dutch. Women in Liechtensteiner costume handed out leaflets with the National Anthem, so we could all sing along. Not long after we arrived, the procession from the Schloss started. First there was a fanfare, the members of parliament, the government and then the Princely Family. A hostess announced everyone and welcomed everyone on the meadows in German and English. The members of the Princely Family in the procession were: Prince Hans-Adam II and Princess Marie, Hereditary Prince Alois, Hereditary Princess Sophie and their children (Prince Joseph Wenzel, Princess Marie Caroline, Prince Georg and Prince Nikolaus), Prince Constantin, Princess Marie and their children (Prince Moritz, Princess Georgina and Prince Benedikt), Prince Nikolaus and Princess Margaretha and one of Princess Tatjana's daughters (can't remember which one). My pictures of the Princely Family in the procession are not great, because when they approached, I was distracted by a man, who asked me: "Which one is the President?". That was the strangest question, wasn't it? After I explained that Liechtenstein doesn't have a President, but a Prince, I quickly went to another spot to make more pictures, but they were not great either. Once the members of the Princely Family had taken their places, it was easier to take some pictures. After a short introduction by the hostess, the Hereditary Prince gave his speech, followed by a speech of the President of the Landtag. It was interesting to see that the Family wouldn't sit down on the benches. Only Princess Marie sat down eventually, which I can imagine, given her age and the fact that the sun was burning. She and Hereditary Princess Sophie also got the protection of an umbrella at a given moment. Luckily, under the benches, there were little bottles of water, so they could prevent themselves from drying up. When the speeches began, I really had to find some shadow; my boyfriend and walked up the very steep hill to find shadow. I walked through the crowd and saw a young woman with sunglasses, who looked familiair: I was almost sure that it was Princess Maria-Anunciata, daughter of Prince Nikolaus and Princess Margaretha. The sight from the meadows, looking to the Schloss, is glorious: this medieval castle, with the Alps in the background. Stunning! When the speeches were over and we had all sung the National Anthem, I went back to the lawn to the Schloss to make more pictures of the Princely Family on their way back to the Schloss. I think these are quite nice! After that, everyone was, by tradition, invited for an apperitif in the grounds near the Schloss and in the Rose Garden of the Schloss. There were several stands, both inside and outside the garden, where one could get soft drinks, sandwiches, fruit and, of course, beer. All complimentary. Isn't that incredibly hospitable? As you might know, the really great thing about the apperitif in the Rose Garden is the fact that members of the Princely Family mingle with the public, while having a drink. All very low key and relaxed. One of my goals of the day was, of course, to meet a member (or members) of the Princely Family: that would be amazing. But what should I say to them? I'd probably get very nervous. Some time ago, I came up with this idea: I could bring my copy of Uve Harder's book The Fürstliche Familie von Liechtenstein and I could ask members of the Family whether they would like to sign the book for me. That would give me a reason to approach them, without the need to have an extensive conversation. So with the book and a pen (it's all about the details, leave nothing up to chance!) in my bag, I went into the Rose Garden on my own, while my boyfriend would relax in the meadows (it was so nice of him anyhow that he wanted to join me on this day, because royalty isn't really his thing). First, I just walked around a little bit. The atmosphere was very relaxed and I got the impression that a lot of locals were there and less tourists (but I could be mistaken). First, I saw Prince Constantin and Princess Marie talking to some people. A little further stood Prince Hans-Adam II. There were a lot of people around him and he was in a very animated conversation. Sweat was literally dripping from his head: he swept the sweat with a handkerchief. Next, I saw the Hereditary Prince and Hereditary Princess. Both had a lot of people around them. They both had umbrellas protecting them from the sun. A little further I saw Princess Margaretha. She seemed to be in deep conversation with some people. No other people around her waiting to get in touch with her. I really wanted to meet her: she's as royal as it gets, right? (As you probably know, she is, besides the sister-in-law of the Prince of Liechtenstein, also a sister of the Grand Duke of Luxembourg and a first cousin of the King of the Belgians) I was lingering for a while, waiting for the moment her conversation would be over, but that moment didn't come naturally. Luckily, the woman in the party noticed me and she draw me to the Princess's attention, who hadn't seen me yet. Princess Margaretha turned to me with a big smile. I apologized for disturbing her, shook her hand and I said what an honour it was for me to meet her. She said I didn't bother her at all. Then I asked her to sign the book, which she was very willing to do. She laughed and apologized for the shaky signature (it's not easy writing while standing). She asked where I came from and then she agreed to pose for a picture of her and me, which was taken by the woman who brought me to her attention. After that we shook hands again and she wished me a great day. I was so happy! I was so nervous, but she was so friendly, that I felt at ease very quickly. Alright: next royal! A little further in the garden was Princess Margaretha's husband, Prince Nikolaus. Once I got his attention, I held on to the same routine as I did with his wife: handshake, signature in the book and a picture. The Prince was also very friendly and he also asked where I came from (logical question of course). I was less nervous this time. Then suddenly, a man approached me. He pointed at my book and said: "That's my book!" It was Mr Harder, the author! He also signed the book and asked me whether I liked it. Nice to have met him as well! Feeling quite relaxed, I decided to approach Hereditary Princess Sophie. She wasn't surrounded by that many people anymore and after a little waiting, I met her. Again: handshake and signing of the book. She had a little trouble holding the book, so I helped her. While signing, she said: "I'm so glad I put my glasses on today!". I got very nervous though when I wanted to start the camera on my phone so that a woman who was standing there could take a picture of me and the Hereditary Princess: my phone has touch ID to unlock, but as my hands were sweaty because of the weather, my phone didn't recognize my fingerprint. So I had to punch in the access code, which went wrong because I got nervous. Nerve wrecking! It seemed to take ages to start the camera, but in the end, it all worked out! After that, I decided to go back to my boyfriend; he had been waiting long enough now and I was very satisfied with having met a prince and two princesses. I saw Prince Joseph Wenzel in a corner of the garden, I saw Princess Marie Caroline passing by with some beers and I saw Princess Maria-Anunciata chatting, but it was enough for me. Mission accomplished! We walked down the hill, into Vaduz, where the fair was in full swing. We could have explored Vaduz, but we only wanted to get in our airconditioned car and drive the 2,5 hours route back to our holiday address in Bavaria! I'm sure I'll get back to Liechtenstein one day to see more of the country! My last piece of advice: think carefully about what you're wearing. Although it's a very low key, non-official and relaxed event without a dress code, many people (mainly Liechtensteiners) were dressed in a more or less formal way. On the other hand, many other people were very casually dressed in accordance with the very hot weather. I was wearing a shirt, but I also wore shorts. One could say that this was a bit too informal when you'd like to meet members of the Princely Family. I must say that I was a bit misled by watching pictures of previous years, in which it seemed like most people were dressed in a very casual way in case it was hot; that was not entirely the case. Summarizing, I think it would have been better if I had worn trousers, notwithstanding the hot weather. But I must say that, despite of my possible faux pas, I think the Princely Family doesn't really care; their only interest that day seems to be able to have contact with their people and all the interested people who show up. I hope you've enjoyed my report! It was great experience and I'm very grateful to the Prince of Liechtenstein for his hospitality. I think Liechtenstein's National Day is a unique event and I advice every Luxarazzi reader to go to the National Day if you get the chance. Can you think of any other event where you can visit a unique country, can get invited to the gardens of a reigning Prince's castle in a breathtaking environment, can get complimentary drinks and sandwiches and, most importantly, can get easy access to royalty? The answer is 'no', right? !